Nicholson's pub just by Tottenham Court Road Station. It's the only remaining pub with an Oxford Street address. 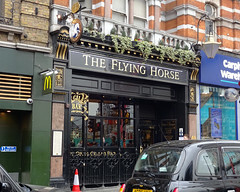 It was previously known as the Tottenham photo, but was renamed to the Flying Horse after a mid-2015 refurbishment. According to the Aug/Sep 2015 London Drinker, this was its original name. We haven't visited since the refurb, so some of the information below may be out of date. It should be a bad tourist trap because of the location, but serves excellent food and well-kept real ales, and has friendly staff. Howard visited in March 2008, and had a very good Steak and Timothy Taylor's Landlord Ale Pie, accompanied by three well-kept pints of Landlord. Food is served downstairs; it can be a bit crowded. Last edited 2016-04-03 10:23:13 (version 16; diff). List all versions. Page last edited 2016-04-03 10:23:13 (version 16).